If you’re a long time reader of this blog you’ll know that I’m a big fan of something new or different. The variety that you have in gluten free food here in Germany is very small compared to my home country of Britain. Not that I have a problem with the Schaer/Schnitzer/Seitz of the world, it’s great that they provide all the every day items, but sometimes I’d like something a little more special. Thankfully, some entrepreneurs are setting up online shops just to fill that niche. Today we’re talking about glutso.com, a new Italian based gluten free shop with lots and lots of things you cannot buy here in Germany! Perfect. They were kind enough to send me a box of items to try out for a review, a good combination of pastas and cookies and such. So, let’s just get to it. First up, the pasta selection. The pasta you can buy here in Germany is, well, technically pasta. It’s not terrible, but it is also not great. Now if there’s one thing you would expect an Italian gluten free shop to have, it’s good pasta. First up is the Tri Colour Pasta. Just look at it, good packaging and good quality looking pasta. It is worth noting here that all of this pasta is a little more sensitive to cooking times, so you have to be very careful not to under or over cook it. I, unfortunately, am not an expert pasta cooker, but even with that I was very happy with what came out. The texture and flavour are amazing, around 57 times better than any gluten free pasta I’ve tried before. Next up is the Corn Pasta, perhaps my favourite out of all the pastas I tried. It’s the closest I’ve had to regular gluten-filled pasta. Next is the Amaranth Fusilli, this one was pretty good but I think I overcooked it a little. Even with that, it’s still a lot better than any other gluten free pasta I’ve tried. Lastly the Chestnut (and rice) Pennette, which again, was a little hard to cook and as a result had a little odd texture to it, but was still pretty good. Overall, each of these pastas if far above what you can find in any shop here in Germany and I would highly recommend you give them a try. You may pay a little more, but you are paying for quality. Plus, they even have Gnocchi! These little almond cantuccini were amazing, certainly the best I’ve had. They were a little powdery, but the flavour was perfect. Farcighiotto, something I’d never really heard of before, but they’re basically shortbread with a chocolate cream filling in the middle. They were a little powdery (see my comments below for all of these cookies), but the flavour was great. Chia and Blueberry cookies, how amazing does that sound! These were delicious, if a little powdery also. The same goes for these little cinnamon cookies, amazing flavour but a little powdery. Next up is Ghiottone, another thing I’ve never really seen before. This was unfortunately the only real disappointment out of everything I tried, the biscuit part was super dry and powdery and the chocolate wasn’t all that great. Next up were some little chocolate muffins, which were again delicious, but the texture was a let down and they were prone to crumbling. I’ve never had a yoghurt muffin before, but these were even better than the chocolate ones, but again, a little crumble prone. Last up are some little Teff Tortillas, they were good but have a very distinct flavour that might not be to every-bodies taste. If you like things made from teff flour, you’ll probably like these though. So, you may be thinking that the pasta sounds amazing, but you’re not too sure about the crumbly/powdery nature of the cookies and muffins. Well, yes, it is a little bit of an issue. But that is what gluten free food is, you’d be hard pressed to find a manufactured cookie that doesn’t have this problem. Plus, the ones that are less powdery/crumbly are usually full of so many chemicals that I’m not sure how good they really are. In the end though, for me the flavour made up for any texture problems. They have a lot more on offer than I’ve reviewed here so be sure go to and have a look through their online shop. You know how it is when you’re walking down the street as a gluten-less person. You glance past all those lovely window displays of things you can’t eat, signs proclaiming the delicious food on offer that, should you eat it, would just poison you. It’s a depressing state of affairs, but, you’re an optimist, so you keep looking, even in the face of overwhelming odds. Then one day, the sun shines and it pays off. It almost didn’t register, I’m so tuned to expect nothing gluten free, but then another sign popped up in front of me. A beer shop that actually advertises it’s gluten free beer options! Amazing. The fact that they are very near to my apartment and this is the first time I’d heard of them was only slightly disturbing. I ventured inside expecting to find the usual Lammsbrau and such. But look at what I found. Not one, but two Mongozo gluten free beers. Plus at a fairly reasonable price! I inquired if this was all they had and the nice helpful man behind the counter pointed me to these. A Pale Ale! Something different than a Pilsner type beer. Happiness. I went back again and within a week they’d already added a new gluten free beer from Norway. Plus, if you look carefully you can find some rather good cider. I have since spoken to the owner and they are looking to expand their gluten free range but are having a hard time sourcing gluten free beers. So if you know of any that they do not stock (and secretly wish they would, I’m looking at you Celia Dark) let them know! In conclusion. Yes, this is THE best place to go and buy gluten free beer in the city and they’re only going to get better. Yes, some of the options may be pricey, but they’re also imported beers and you shouldn’t be complaining at getting to drink delicious gluten free beer anyway. Go now and go often and thank the lovely people there. I may have said it a million times before but it really can be tough finding good gluten free food to eat here in Germany. I’m not sure whether it’s the fact that gluten free is still a relatively new thing here or the fact that gluten free food is treated more like a medicine, a sustenance to be endured rather than enjoyed. Or perhaps it could be the companies here that make the food, or the stores that sell it here, unwilling to think it will sell and demanding long shelf life. Either way, it can be frustrating, especially after getting back from a trip to the UK or USA, having stuffed my face with amazing food. First up, we have my absolute favourite. Bob’s Red Mill Pancake Mix. Bob’s Red Mill simply make the best flours and mixes around (with Doves Farm being a close second), with this one being perhaps the best. Do you want to eat a pancake and not even notice it’s gluten free? This is the flour for you. I’m not sure how I didn’t eat that before I took the picture. But they are just crispy enough, the interior is nice and fluffy without any grainy texture. Perfection. Next up with have their Pizza Crust Mix. It isn’t quite as good as their pancake mix and to be fair, most pizza base mixes are not so great, but it is pretty good. The dough turns out a little sticky as most gluten free versions do. Although a good pizza can be made out of it. So I guess it does it’s job. It’s certainly better than any of the mixes you can buy here and better than the pre-made bases from Schaer and the like. Next is their Four Grain Porridge. I do miss my morning porridge (being British, it’s much more of a brekfast food than the delicious pancakes above) so I was rather excited with this one. Now, yes, you may look at that last picture and think, well, that isn’t porridge, that’s some sand you found. And yes, it does have the consistency of millions of tiny tiny little pebbles. Unfortunately this does carry over into the finished product. I mean, it’s not terrible, but I’ve had better porridge that I’ve made myself from gluten free oats. Next up is little gluten free buns from Alnavit. Both their white and seeded versions. They are of the prepackaged long shelf life variety, but they are also lactose free! So not all bad. To be honest, they’re not my favourite in the world but they are on par with Schaer (only slightly more expensive per gram). If you’re looking to buy bread from foodoase, I’d see my post on Genius first. Next up are some lovely lovely lentil and chickpea chips. It’s definitely good to have something other than potatoes to fulfill my junk needs. The texture is a little odd but they are a great snack food and have a good flavour to them. Not too strong, just enough. They might not be everyone’s cup of tea, but I’d give them a try for at least one packet (of the creamy dill variety, they were rather delicious). Last up is Eat Real Cashew & Cranberry Bars. These were perhaps the most disappointing of the selection. They sound and look good, but they were unfortunately extremely crumbly and quite lacking in flavour. If I had nothing else to hand, they’re good, but otherwise, I’d give them a miss. All in all, foodoase is a great site and they are really trying to provide a good selection of high quality products from around the world. Something that is essential in the somewhat behind German gluten free market. If you have read my first post on Genius, you’ll know that the most amazing thing in the world is happening. 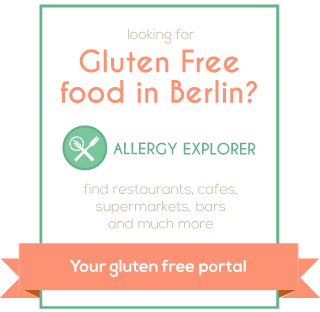 Genius Gluten Free are launching here in Germany!! No more long shelf life bread. No more solid ‘brick buns’. No more sadly eating sandwiches that are a bit naff. Just good, fresh, gluten free bread. It has been almost two months since I learned about all this, but, to be honest I’m still just as excited. Mostly as I can now actually walk into a supermarket and buy Genius bread, even if for the time being it’s only in a few participating Kaisers. I mean, just look at it! ‘But, what should I buy?’ I hear you say. Well. A good first try is their white loaf. It’s nice and soft, fresh and approximately a million times better than any other gluten free loaf you can buy here. Now I know that some of you may prefer a harder loaf. But we’re talking about sandwich bread here, you simply cannot make a good sandwich with a solid block of bread. It’s just terrible. Also, their dark loaf and their similar ‘traditional’ dark bread are pretty damn good too. This one is the best for making toast. Especially cheese on toast, it’s simply amazing, mostly as it actually toasts like real bread. There are of course, their amazing muffins and their absolutely ridiculously good buns. Check out my first post on Genius for my review of them. For now, there is just a trial in eight Kaisers stores. So if you want Genius to stay here in Germany you should go and buy 5 loaves a day. Right now.